Kangaroo ePump pump sets are DEHP-Free and incorporate the Anti-Free Flow safety feature. New PVC material eliminates the use of the compound / chemical DEHP. Incorporates the internal Anti-Free Flow (AFF) Device for continuous protection for the patient from the possibility of a free flow incident. Compatible with Nestle` SpikeRight™* feeding port. 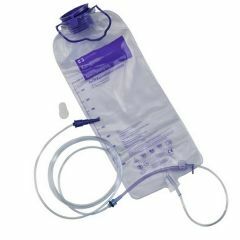 Helps prevent connector to IV tubes and provides a secure fit with feeding tubes. This has a great price. I am a older person.. I care for my wife.. This was used to provide my wife with 1200 cals a day. Very easy to use. Is there another item similar that would fit the Kangaroo Joey machine that may be cheaper? Even a lower ml bag?